Designed by paddlers for paddlers! 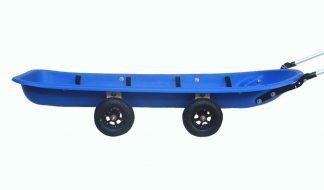 The kneeling saddle enables you to change position in your boat easily. Helps aid a more efficient paddling position. Higher step at back for occasional height change. Lower risk of entrapment than with conventional kneeling thwart, even with wellies. 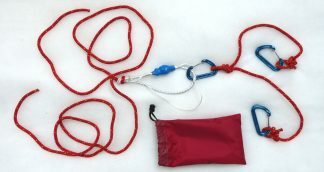 Helps give you an uncluttered boat and makes it easier to get in/out of your canoe. Lightweight, Solid EPS – Expanded Polystyrene Foam shaped block. Hardwearing 1000D texturised nylon cover. No drilling/fitting required. Quickly transfers to any canoe. Quick/easy to trim canoe as solo/ tandem/upwind/downwind. Can be used as third seat. Comfortable and warm. 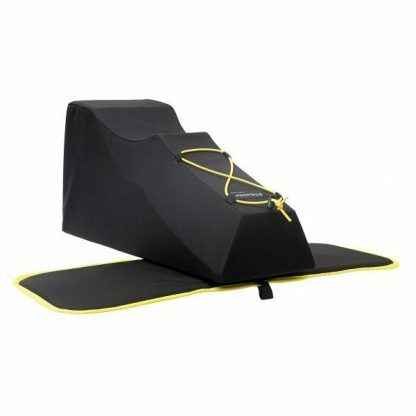 Kneeling pad will not slide away due to the non slip “Tuffgrip” surface – it sticks to boat. Useable as a camp seat and floats in case of capsize. We are often asked which size of Stingray is more suitable for an individual. As a guide, we have found that it is flexibility and general wear and tear on the knees that determines which size of Stingray is more comfortable for an individual rather than their height. A large Stingray is more suitable for a less flexible and usually older person (say over 50 years). A small Stingray is more suitable for a more flexible and usually younger person. Also bear in mind that your centre of gravity in the boat is lower if you are using a small Stingray. It could be a good idea to build a pile of books to the height of each Stingray (large 24cm and small 19cm) and try sitting on each pile. This may help you to decide which size of Stingray would be more suitable for you.